The "Spirit of Columbus," an airplane flown by pioneering female pilot Geraldine "Jerrie" Mock of Newark, Ohio, photographed in a hangar at Port Columbus airport in Columbus, Ohio. In 1964 Mock was the first woman to complete a solo flight around the world. Her trip took less than one month to complete and set speed records for planes of this size. 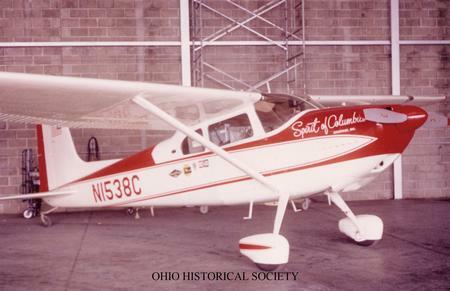 The "Spirit of Columbus" is a Cessna 180 model aircraft manufactured by the Cessna Aircraft Company. Ohio Historical Society SC 202, AL02698 from the Spirit of Columbus Collection.